The complex of artistic and social ideas that we call the ‘Romantic’ movement originated in mid-eighteenth-century England. English artists and poets began to concern themselves with nature in the raw, with exoticism, and with the remote past; architects, obsessed with notions of the picturesque, began to revive the Gothic style; novelists created the Gothic novel. Shakespeare’s plays were crucial texts for the early Romantics; Romeo and Juliet was the perfect expression of hopeless love; Macbeth and A Midsummer Night’s Dream catered for the new interest in the supernatural, in its demonic and benign forms; Hamlet became the model for a generation of moody rebels in literature, particularly in the German Sturm und Drang movement. Shakespeare’s plays had never entirely dropped out of the theatrical repertory in England, except for during the Civil War and Commonwealth period when the theatres were closed. After the Restoration some of them were revived, though they were mostly turned into spectacular operatic shows (Purcell’s The Fairy Queen, a version of A Midsummer Night’s Dream, is a good example), and the texts were made to conform to Augustan ideas of order, symmetry and propriety. In the 1740s David Garrick created a new interest in Shakespeare with a revolutionary naturalistic style of acting. He corrected some of the more glaring corruptions in the texts of the plays, and began to develop the notion of Shakespeare as England’s national bard. The ‘Shakespeare industry’ effectively came into being during the bizarre three-day Shakespeare Jubilee at Stratford in 1769, devised and organized by Garrick. A strange feature of this event, and others that followed it, was that effusive poetic tributes to Shakespeare were preferred to the bard’s own words. Another was that the proceedings were musical rather than thespian. Thomas Arne played a leading role in the 1769 festival, and composed an Ode to Shakespeare with choruses, airs and ‘spoken recitatives’ (which Garrick declaimed to orchestral music); there was also a performance of Arne’s oratorio Judith, which had no Shakespearean connections. Thomas Linley’s ‘Shakespeare Ode’ was written in the wake of the frenzy of ‘bardolatry’ provoked by the 1769 Jubilee. The text was a youthful essay by French Lawrence (1757–1809), later Professor of Civil Law at Oxford. It was first written at Winchester in 1773 as a school exercise, and was set by Linley in a revised and extended form. Lawrence was a native of Bath, where he presumably got to know the Linley family. Thomas Linley senior – singing teacher, concert organizer and composer – was the son of a Gloucestershire carpenter who settled in the city in the 1740s. Thomas’s prodigiously talented children were soon playing a prominent role in Bath’s musical life. Elizabeth Ann, Mary and Maria were accomplished singers and actresses in their teens (Mary and Maria sang in the original performance of the ‘Shakespeare Ode’), while young Tom was playing violin concertos at the age of seven and was an accomplished composer by his early teens; he studied with William Boyce, and then with Nardini in Florence (where he met Mozart) from 1768 to 1771. Lawrence’s text for the ‘Shakespeare Ode’ is an evocation of the supernatural element in Shakespeare’s plays, more concerned with the creation of wild, pre-Romantic atmospheres than with precise meaning. Nevertheless, a ‘plot’ of sorts can be discerned. The chorus begins by addressing the ‘guardian of that sacred land Where Avon’s wood-crown’d waters stray’. In turn, this Spirit of Avon summons Fancy who describes how Jove entrusted the infant Shakespeare to her care. Shakespeare’s youth ‘in old Arden’s inmost shade’ is described, and then the poet embarks on an evocation of the fairy atmosphere of A Midsummer Night’s Dream, conducted with phraseology derived more from Milton than from Shakespeare. In Part 2 the skies suddenly darken, and attention shifts to the Gothic horror of Macbeth; the bass acts as a fearful but questioning observer to the ‘deeds without a name’ of the witches. The day dawns, and with it rationalism; in the clear light of the eighteenth century, the poet seems to say, elves have ceased to chase ‘with printless pace’, and Ariel no longer sails ‘along the sky’ (his flight memorably portrayed in an air with oboe obbligato, first cousin to one given to Ariel in Linley’s Tempest music). The problem, the sopranos sing in their duet, is that no one can ‘wield like Shakespeare’s skilful hand That magic wand, whose potent sway The elves of earth, of air, and sea obey’. The chorus ends the work by calling upon Fancy to ‘give another Shakespeare to our isle’. Like much English music of the period, the ‘Shakespeare Ode’ is eclectic in style. The first two movements of the overture are in the archaic French Baroque pattern, a dotted introduction followed by a fine extended fugue (which the reviewer thought ‘masterly’); then comes a minuet with prominent writing for oboes and horns in the modern German symphonic style. 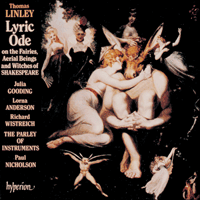 In the succeeding airs and choruses Linley’s music has echoes of Purcell (in the first and last choruses), Handel (in a number of the airs), Thomas Arne (notably in the duet ‘For who can wield?’), and J C Bach (the exquisite airs ‘There in old Arden’s inmost shade’ and ‘Ariel, who sees thee now?’). Yet Linley’s own compositional voice is never swamped by his musical heritage, and in the chorus ‘What howling whirlwinds!’ he produced an astonishing evocation of early Romanticism that looks forward to Weber, Mendelssohn and even Berlioz. The reviewer thought it ‘finely expressive of sentiment’. We have added trombones to the lower vocal lines in this movement, for they are known to have featured in the original performance, though no parts for them survive; trombones were nearly always associated with the supernatural in eighteenth-century orchestral music. L’ensemble d’idées artistiques et sociales que nous appelons le mouvement «Romantique» eut son origine en l’Angleterre du milieu du XVIIIe siècle. Les artistes et les poètes anglais commencèrent s’intéresser à la nature telle qu’elle était, à l’exotisme et au passé lointain; les architectes, obsédés par des notions de pittoresque, se mirent à ressusciter le style gothique; les romanciers inventèrent le roman gothique. Les pièces de Shakespeare furent des textes déterminants pour les premiers romantiques: Roméo et Juliette était la parfaite expression de l’amour sans espoir; Macbeth and Le songe d’une nuit d’été alimentaient la nouvelle préoccupation de surnaturel, sous ses formes démoniaques et douces; Hamlet servit de modèle à une génération de rebelles maussades en littérature, en particulier en Allemagne, dans le mouvement Sturm und Drang. Les pièces de Shakespeare n’avaient jamais complètement disparu du répertoire théâtral en Angleterre, sauf pendant la période de la Guerre civile et de la république de Cromwell où les théâtres avaient fermé leurs portes. Après la Restauration, certaines de ces pièces furent reprises, mais elles furent surtout transformées en représentations d’opéra spectaculaires (The Fairy Queen de Purcell, adaptation du Songe d’une nuit d’été, en est un exemple typique), et les textes étaient modifiés pour se conformer aux idées néoclassiques d’ordre, de symétrie et de décence. Dans les années 1740, David Garrick suscita un nouvel intérêt pour Shakespeare avec un style d’interprétation naturaliste révolutionnaire. Il corrigea quelques une des corruptions les plus évidentes du texte des pièces et amorça le développement de la conception de Shakespeare comme poète national. L’industrie shakespearienne naquit en fait au cours des trois jours du bizarre Jubilé de Shakespeare à Stratford, en 1769, conçu et organisé par Garrick. Une étrange caractéristique de cet événement et de ceux qui le suivirent, c’est qu’on préféra d’interminables hommages poétiques à Shakespeare aux propres œuvres du grand homme. Une autre est que les célébrations furent musicales plutôt que théâtrales. Thomas Arne joua un rôle important dans le festival de 1769 et composa une Ode à Shakespeare avec des chœurs, des airs et des «récitatifs parlés» (que Garrick déclama sur un fond de musique orchestrale); on joua aussi l’oratorio d’Arne, Judith qui n’avait aucun rapport avec Shakespeare. L’«Ode à Shakespeare» de Thomas Linley fut composée à la suite de la débauche d’idolâtrie shakespearienne provoquée par le Jubilé de 1769. Le texte était un essai de jeunesse par French Lawrence (1757–1809), qui fut plus tard Professeur de Droit Civil à l’Université d’Oxford. Il l’avait écrit à Winchester, en 1773, comme exercice scolaire, et Linley le mit en musique sous une forme corrigée et allongée. Lawrence était né a Bath, où il fit sans doute la connaissance de la famille Linley. Thomas Linley l’Aîné – professeur de chant, organisateur de concerts et compositeur – était le fils d’un menuisier du Gloucestershire qui s’était établi dans la ville dans les années 1740. Les enfants prodigieusement doués de Thomas jouèrent bientôt un rôle important dans la vie musicale de Bath. Elizabeth Ann, Mary et Maria étaient des cantatrices et actrices accomplies dès leur adolescence (Mary et Maria chantèrent dans la première représentation de l’«Ode à Shakespeare»), et le jeune Tom jouait des concertos de violon à l’âge de sept ans et était un excellent compositeur avant quinze ans; il étudia avec William Boyce, puis avec Nardini de 1768 à 1771, à Florence où il rencontra Mozart. Le texte de Lawrence pour l’«Ode à Shakespeare» est une évocation de l’élément surnaturel dans les pièces de Shakespeare, cherchant davantage à créer des atmosphères pré-romantiques sauvages qu’à exprimer une signification précise. Cependant on peut y deviner une sorte de scénario. Le chœur commence par s’adresser à la «gardienne de cette terre sacrée, où serpentent les eaux couronnées de bois de l’Avon». À son tour, cet Esprit de l’Avon invoque l’Imagination, qui raconte comment Jupiter lui a confié Shakespeare nouveau-né. La jeunesse de Shakespeare «au plus profond des ombrages de la vieille forêt d’Arden» est décrite, puis le poète se lance dans une évocation de l’atmosphère féerique du Songe d’une nuit d’été, avec une phraséologie inspirée davantage de Milton que de Shakespeare. Dans le deuxième partie, le ciel s’assombrit soudain et l’attention se concentre sur les horreurs gothiques de Macbeth; la basse joue le rôle d’observateur craintif, mais curieux, des «crimes qui n’ont pas de nom» commis par les sorcières. Le jour se lève et le rationalisme paraît aussi; à la claire lumière du XVIIIe sièce, semble dire le poète, les elfes ont cessé de vous poursuivre «de leurs pas légers» et Ariel ne glisse pas «dans le ciel» (son vol est représenté da façon mémorable dans un air avec hautbois obbligato, apparenté à celui que Linley donne à Ariel dans sa musique de scène pour Le tempête). Le problème, chantent les sopranos, en duo, c’est que personne ne peut «brandir comme la main habile de Shakespeare cette baguette magique dont la puissante emprise fait obéir les elfes de la terre, de la mer et des airs». L’œuvre se termine par la requête du chœur à l’Imagination de «donner un autre Shakespeare à notre île». Comme beaucoup de musique anglaise de l’époque, l’«Ode à Shakespeare» est d’un style éclectique. Les deux premiers mouvements de l’ouverture se conforment à la formule archaïque du style baroque français: une introduction pointée suivie par une belle et longue fugue (que le critique trouva «magistrale»); puis vient un menuet avec d’importants passages pour les hautbois et les cors, dans le style symphonique allemand moderne. Dans les airs et les chœurs qui suivent, la musique de Linley a des échos de Purcell (dans le premier et le dernier chœur), de Hændel (dans plusieurs des airs), de Thomas Arne (en particulier dans le duo «For who can wield?») et J. C. Bach (les airs ravissants «There in old Arden’s inmost shade» et «Ariel, who sees thee now?»). Mais cependant la voix personnelle de Linley n’est jamais étouffée par son héritage musical et dans le chœur «What howling whirlwinds!» il a créé une étonnante évocation du début du Romantisme qui annonce Weber, Mendelssohn et même Berlioz. Le critique y vit «une belle évocation de sentiment». Nous avons ajouté des trombones aux lignes vocales de basse dans ce mouvement car on sait qu’ils participaient à la représentation originale, bien que leurs partitions n’aient pas survécu; les trombones étaient presque toujours associés au surnaturel, dans la musique orchestrale du XVIIIe siècle. Der Komplex der künstlerischen und gesellschaftlichen Vorstellen der sogenannten „romantischen“ Bewegung hatte seinen Ursprung im England der Mitte des achtzehnten Jahrhunderts. Englishe Künstler und Dichter begannen, sich mit der „rohen“ Natur zu befassen, mit dem Exotischen und mit der fernen Vergangenheit. Architekten, besessen von der Idee des Malerischen, griffen den Stil der Gotik wieder auf, Schriftsteller schufen den gotischen Roman. Für die frühen Romantiker waren die Texte Shakespeares von größter Bedeutung: Romeo und Julia war die perfekte Darstellung einer hoffnungslosen Liebe; Macbeth und Ein Sommernachtstraum erfüllten das neue Interesse am Übernatürlichen sowohl in seiner bös- als auch gutartigen Form. Hamlet wurde zum Rollenmodell für eine Generation leidenschaftlicher Rebellen der Literatur, besonders im deutschen Sturm und Drang. Shakespeares Schauspiele waren in England nie ganz aus dem Theaterrepertoire ausgeschiedenen worden, außer in der Zeit des Bürgerkrieges und des Commonwealth, als die Theater geschlossen waren. Nach der Restauration wurde einige wieder aufgegriffen, doch wurden sie zumeist in spektakuläre Opernaufführungen umgewandelt (zum Beispiel ist Purcells Die Feenkönigin eine Version von Ein Sommernachtstraum), und die Texte wurde so gestaltet, daß sie der augustanischen Vorstellung von Ordnung, Gleichmaß und Schicklichkeit entsprachen. Um 1740 herum erzeugte David Garrick mit einem revolutionären, naturalistischen Darstellungsstil neues Interesse an Shakespeare. Er berichtigte einige der krassesten Korrumpierungen in den Texten der Schauspiele, und mit ihm begann die Entwicklung der Vorstellung von Shakespeare als Nationalbarde Englands. Die Shakespeare-„Industrie“ nahm ihren Anfang effektiv mit dem drei Tage dauernden Shakespeare-Jubiläum im Jahre 1769 in Stratford-on-Avon, das Garrick ins Leben rief und varanstaltete. Ungewöhnlich an diesem und anschließenden Ereignissen war, daß die überschwenglichen poetischen Huldigungen an Shakespeare den eigenen Worten des Barden vorgezogen wurden. Außerdem wurden die Vorstellungen eher musikalisch als thespisch dargeboten. Im Festival des Jahres 1769 spielte Thomas Arne eine leitende Rolle, und er komponierte eine Ode an Shakespeare mit Chören, Arien and „gesprochenen Rezitativen“ (die Garrick zur Muzik des Orchesters deklamierte). Bei dieser Gelegenheit wurde auch eine Vorstellung von Arnes Oratorium Judith gegeben, die keine Verbindung mit Shakespeare hatte. Thomas Linleys „Shakespeare-Ode“ war als Folge der Shakespeare-Vergötterung, hervorgerufen durch das Jubiläum im Jahre 1769, geschrieben worden. Der Text beruhte auf einem Jugendaufsatz von French Lawrence (1757–1809), später Professor für Zivilrecht in Oxford. 1773 zuerst als Schularbeit in Winchester verfaßt, vertonte ihn Linley in überarbeiteter und erweiterter Form. Lawrence war in der Stadt Bath geboren, wo er vermutlich die Familie Linley kennenlernte. Der Gesangslehrer, Konzertveranstalter und Komponist Thomas Linley senior war der Sohn eines Zimmermanns aus Gloucestershire, der sich um 1740 in der Stadt niederließ. Linleys erstaunlich begabte Kinder spielten schon bald eine bedeutende Rolle im musikalischen Leben der Stadt. Elizabeth Ann, Mary und Maria waren als junge Mädchen talentierte Sängerinnen und Schauspielerinnen (Mary und Maria sangen in der Uraufführung der „Shakespeare-Ode“), und der junge Tom spielte schon mit sieben Jahren Violinkonzerte und war also Zwölf- oder Dreizehnjähriger ein talentierter Komponist. Er studierte bei William Boyce und danach von 1768 bis 1771 bei Nardini in Florenz, wo er Mozart kennenlernte. Lawrences Text für die „Shakespeare-Ode“ ist eine Beschwörung des Übernatürlichen in den Schauspielen Shakepeares und er befaßt sich mehr mit der Erzeugung einer wilden, vorromantischen Stimmung als mit einer genauen Bedeutung. Trotzdem läßt sich eine Art von „Handlung“ feststellen. Zu Beginn wendet sich der Chor an den „Hüter des heiligen Landes, wo Avons waldgekrönte Wasser rauschen“. Dann ruft dieser Geist des Avons Fancy an, die beschreibt, wie Jupiter ihr den Säugling Shakespeare anvertraut. Es wird Shakespeares Jugend „im tiefsten Schatten des alten Ardens“ beschrieben, und darauf beschwört der Poet eine Feenstimmung aus Ein Sommernachtstraum, die in ihrer Ausdrucksweise jedoch eher an Milton als an Shakespeare zu erinnern scheint. In Teil 2 verdunkeln sich die Himmel plötzlich und die Aufmerksamkeit wird auf die Schauerlichkeiten von Macbeth gelenkt; der Baß agiert als furchtsamer, doch neugieriger Beobachter der „Taten ohne Namen“ der Hexen. Der Tag bricht an und damit auch die Erkenntnis; aus der Aufklärung des achtzehnten Jahrhunderts scheint der Dichter sagen zu wollen, daß die Elfen nicht mehr „mit spurlosen Schritten“ umherjagen, und daß Ariel nicht mehr „durch die Lüfte“ fliegt (sein Flug wird auf unvergeßliche Weise mit einer Arie mit Oboenobligat dargestellt und ist eng mit der aus Linleys Musik für Der Sturm verwandt). Die Schwierigkeit, wie die Soprane es in ihrem Duett besingen, liegt darin, daß keiner „wie Shakespeares fähige Hand den Zauberstab führen kann, dessen kraftvollem Schwung die Elfen der Erde, des Meeres und der Luft gehorchen“. Der Chor schließt das Werk mit einer Bitte an Fancy ab, „unserer Insel doch noch einen Shakespeare zu geben“. Wie viele andere Musikstücke der Zeit ist der Stil der „Shakespeare-Ode“ eklektisch. Die ersten beiden Sätze der Ouvertüre verlaufen nach dem alten Muster des französischen Barockes, eine punktierte Einleitung gefolgt von einer feinen erweiterten Fuge (die der Kritiker als „meisterhaft“ bezeichnete). Dann folgt ein Menuett, in dem die Oboen und Hörner nach moderner deutscher Symphonieart hervorgehobenen werden. In den anschließenden Arien und Chören hat Linleys Musik Anklänge an Purcell (im ersten und letzten Choreinsatz), Händel (in mehreren Arien), Thomas Arne (besonders in dem Duett „Denn wer kann führen?“) und Johann Christian Bach (die auserlesenen Arien „Dort im tiefsten Schatten des alten Arden“ und „Ariel, wer sieht dich nun?“). Doch wird Linleys eigene Kompositionsstimme nie von seinem musikalischen Erbe übertönt, und im Chor „Welch heulende Winde!“ erzeugt er ein erstaunliches Wachrufen der frühen Romantik, die auf Weber, Mendelssohn und sogar Berlioz hinweist. Der Kritiker hielt das Stück für „einen sehr feinen Gefühlsausdruck“.